Eagles are some of the largest birds. They are at the top of the food chain, with some species feeding on big prey like monkeys and sloths. Eagles have amazing eyesight and can detect prey up to two miles away. How many species of eagle are there? Eagles are birds of prey in the family Accipitridae; there are approximately 60 different species. The majority are found in Eurasia and Africa, with only 14 species found in other areas including North, Central and South America, and Australia. What do eagles look like? With the exception of some vultures, eagles are generally larger than other birds of prey. They have strong muscular legs, powerful talons and large hooked beaks that enable them to rip the flesh from their prey. Eagles vary in size. One of the smallest species, the little eagle, is around 17.7–21.7 in (45–55 cm). In contrast, Stellers’s sea eagle is around 36–42 in (91–106 cm) in size, and wingspan can reach approximately 72–96 in (2–2.5 m). Sight is the strongest of all eagle senses. The eyes are large, can take up almost 50% of the head, and can weigh the same amount as a human eye. An eagles vision is 4–5 times better than that of a human. Eagle eyes are angled 30 degrees away from centre of the face, which gives eagles a greater field of view. Eagles can see five basic colours to our three, and can detect UV light. Cones are light detecting cells that are sensitive to colour. One of the reasons that eagles have better vision than humans is because their retinas, a layer at the back of the eyeball, have more cones. We have 200,000 cones per square millimetre, whereas eagles have one million. Eagles are monogamous, so generally mate for life. They have strong site fidelity, so a mating pair tend to reuse the same nest year after year. Nests, composed of sticks, vegetation, and downy feathers, are built by both males and females. Location of the nest varies with species. 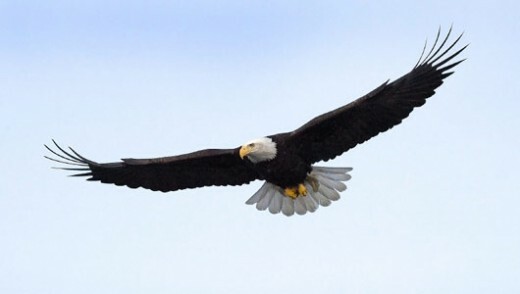 Bald eagles for example, most likely nest in tall trees whereas as golden eagles prefer cliff faces or more open areas. How many eggs do eagles lay? The number of eggs laid will depend upon species, but many eagles lay between one and three eggs; four egg clutches do occur, but they are rare. Eagles are apex predators, meaning they are at the top of the food chain. What eagles eat depends upon the species and the food that is available to them, but they are all carnivorous and live on a diet of meat and/or fish. Eagles can be divided broadly into four groups; sea eagles, booted eagles, snake eagles and giant forest eagles. Booted eagles have a relatively wide diet consisting of birds, small mammals, reptiles, rodents, amphibians and insects, whereas others are more restricted. Sea eagles or fish eagles feed mostly on a diet of fish whilst snake eagles specialise on capturing reptiles. Giant forest eagles feed on various forest animals. One of the largest eagles, the Harpy eagle, feeds on larger animals including monkeys, sloths and coatis. Habitat: Varied, though usually near trees and water.